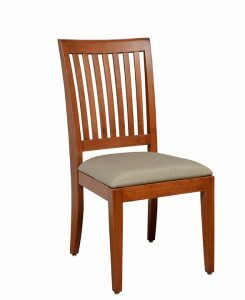 Eustis Chair designs and manufactures elegant & comfortable hardwood chairs, with a focus on truly superior durability. All chairs are made to order in the USA with dozens of designs to choose from. With dozens of designs in our line, there is a pretty good chance we have an existing chair that will fit the needs of your institution. However, in case you do not see a chair whose design fits your application, we can often design a new chair for you. 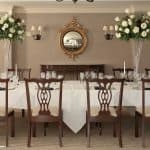 We pride ourselves on the broad range of places our chairs serve to complement. Here we have compiled some of our most stunning installations to date, all categorized by institutional use. Since 1989 Eustis Chair has been the industry leader for hardwood stacking chairs. Since our first project for Harvard University we have supplied seating for America's foremost clubs, schools, and prime institutions. Contact us to learn more about our unmatched stacking and non-stacking hardwood chairs, options, pricing, or to request sample chairs. Eustis Chair is proud to custom manufacture our hardwood chairs in our U.S factory from sustainably grown hardwoods. We look forward to helping you! In 2017 the Joan Weill Adirondack Library, which serves Paul Smith’s College in upstate New York, received sixty Charleston chairs to replace their previous seating, which could not stand up to the daily rigors of library demands. Our warranty covers twenty years for even the busiest libraries in the country, although their service life will last much longer. Plus, the Library and College are pleased with our chair sustainability measures from the lumber sourcing all the way to factory recycling measures – truly a match for the only four-year college in the Adirondack Park! Eustis Chair was founded in 1989, and since then we've become the industry leader for hardwood stacking chairs. Contact us today to discuss your design vision, guaranteed to last decades and withstand the test of time.